From the quiet beaches to the summer cottages to the artist colonies, a visit to the Sunshine Coast in British Columbia, Canada feels like an island getaway. The area, less than two hours from downtown Vancouver, extends 177 km (110 mi) along the Strait of Georgia from Howe Sound to Desolation Sound. 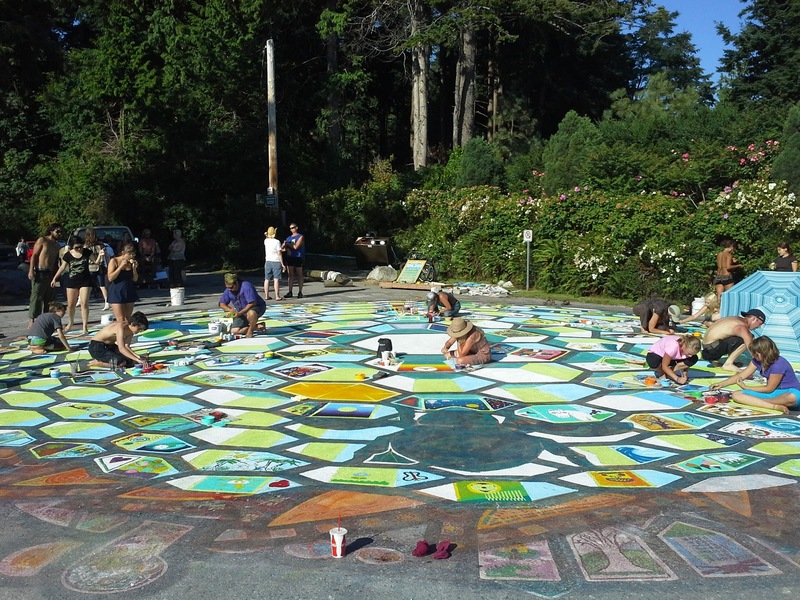 It was here that my spouse and I participated in a collaborative art project that not only reminded me what the definition of community really is but also how it is necessary for the bigger picture. 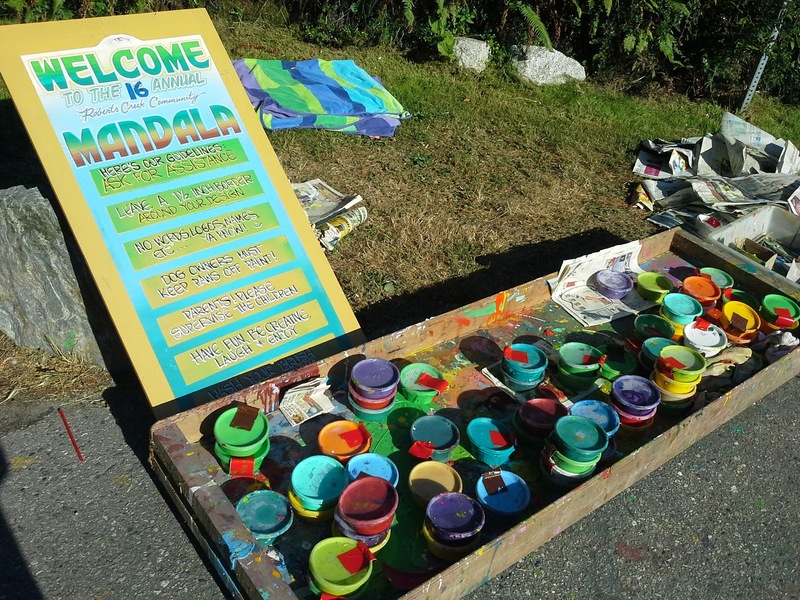 The event allows members of the community, tourists and weekenders to pick up a brush, tap into their inner artist and contribute to a much larger picture. 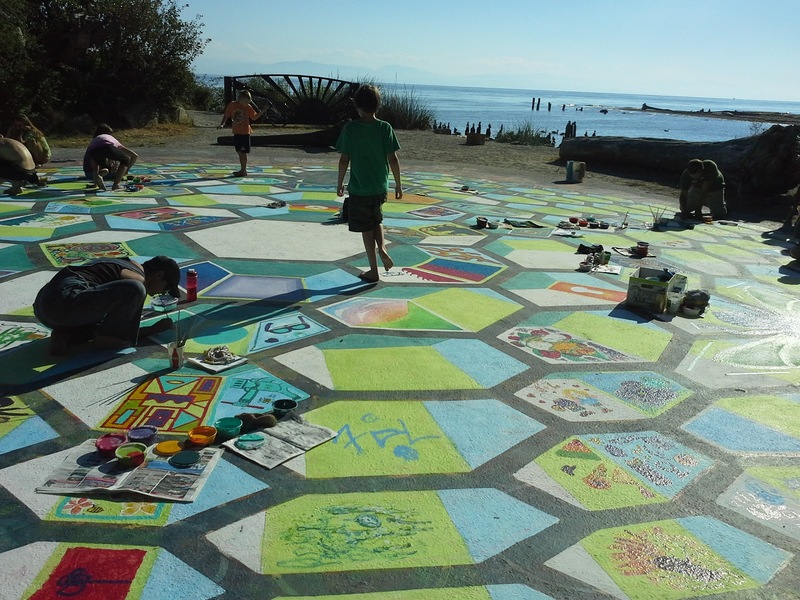 Last year’s community mural was of an owl, designed by artist Robert Marion with an amazing team of volunteers and painted by an estimated 600 people. The image for 2013, revealed on Thursday for the weekend painting project consisted of three bees and what appeared to be a honeycomb backdrop. 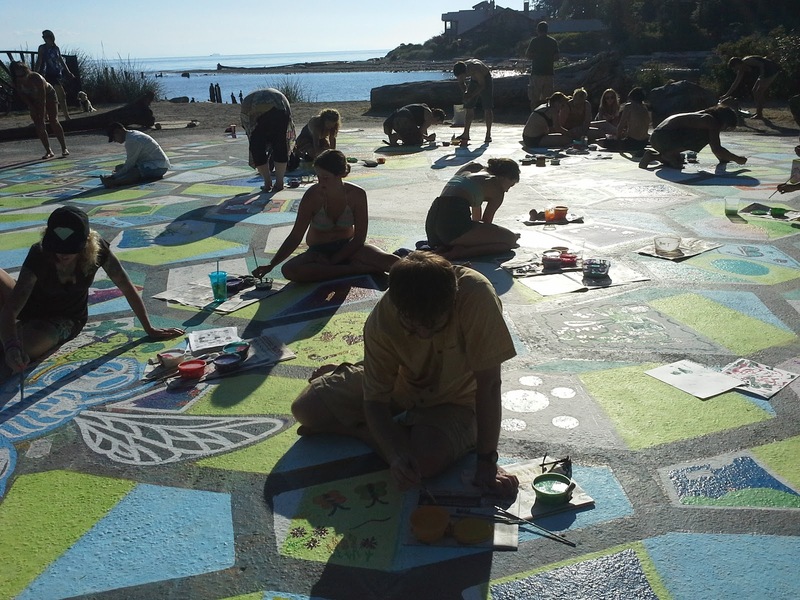 My husband and I arrived shortly before sunset on Friday and there were about 100 people milling around the pavement art project. Some were painting their contribution on the marked off areas, others were assisting new comers and some were just enjoying the experience. While neither one of us would label ourselves painters, my husband and I did kick off our shoes, pick up a brush and added our own colorful design to the greater picture. It wasn’t about our talents or even what it was that we wanted to draw. It was about using a common medium to express ourselves to create a bigger picture. 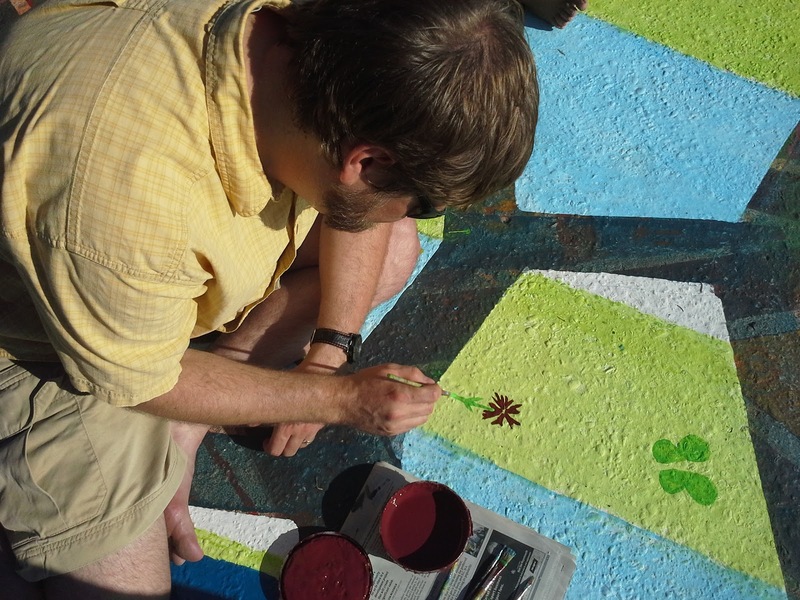 The event reminded me of how each one of us, in our own artistic way, adds color to our surrounding community. Whether it is pottery, painting, writing, cooking or yoga practice, each one of us has a passion that when channeled through our work, play or both adds to our surroundings as a whole. It’s a necessary element. It was an amazing feeling to be part of something bigger, grander and with so much heart. 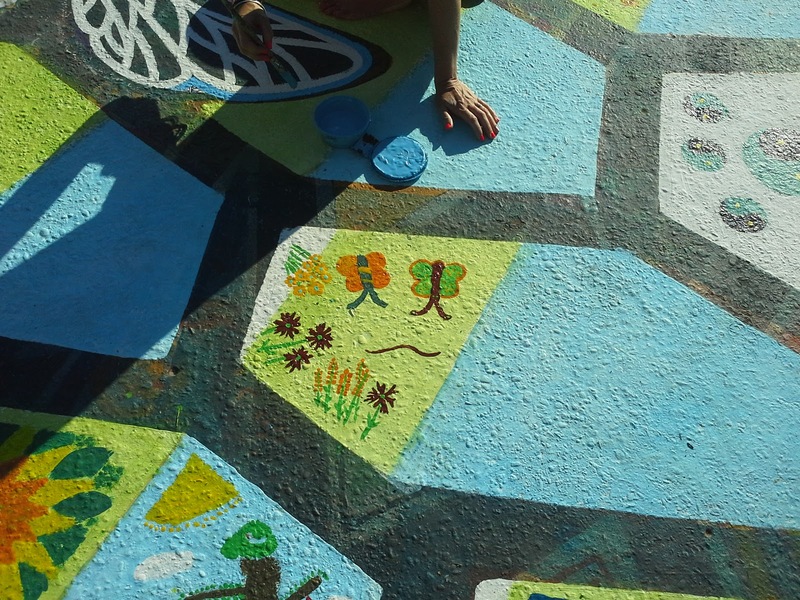 For the next year, a part of our creativity will be on display in Robert’s Creek. But the lesson learned from the paintbrush will linger far longer. For additional photos and to check the progress, click here!